The winter holidays are coming to a close so it's time to start thinking about retiring the trees, wreaths and other greenery that have adorned our homes and offices the last month. Nobody wants to be the person who leaves their tree up until May. In Washington, D.C., holiday trees and wreaths will be picked up curbside from January 3 to January 14. Remove all decorations and place the greenery in the treebox space in front of your home between Monday, January 2, and Monday, January 9. Do not put the trees in plastic or cloth bags. 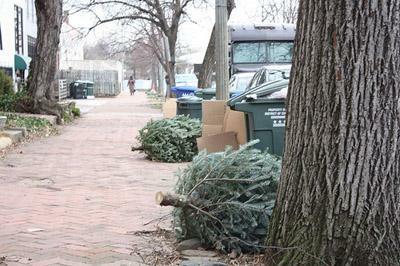 Trees collected between January 3 and 14 will be recycled. Note that trees placed on the curb after January 14 will be picked up by trash trucks as space allows and will NOT be recycled. So help save valuable space in our landfill and get your greenery outside for pickup before the recycle deadline.